The second installment of the ‘World’s Smartest’ story continues here with Lunella getting to meet Aunt Petunia’s favorite nephew, Benjamin J. Grimm, the ever-lovin’ blue-eyed Thing. Guest artist, Ray-Anthony Height, joins writers, Amy Reeder and Brendan Montclare, along with colorist Tamra Bonvillain. The glory and excitement of being identified as the ‘world’s smartest’ fades for Lunella rather quickly as it becomes evident that being the smartest of the smart brings with it a lot of unwanted attention. Lunella is approach by The Thing who has recently returned from a long trip in outer space alongside the Guardians of The Galaxy. 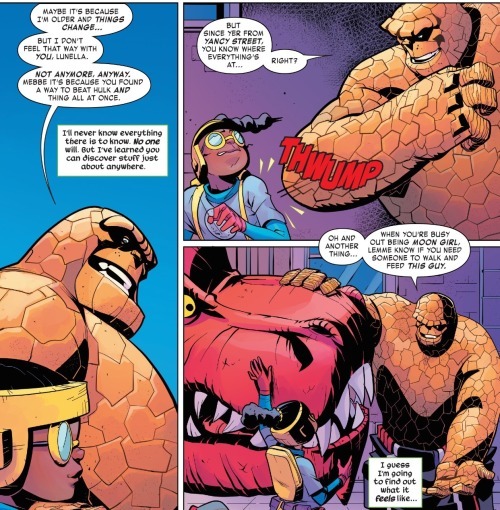 He had learned of Lunella new status as the brightest of the bright and, her being a fellow denizen of the Yancy Street neighborhood, The Thing feels obligated to check in on the little squirt and offer her some advice. Lunella is not especially impressed with the rough-talking Thing. Sure the guy has helped save the world more times than she can count, yet he proves to be just another grown up talking down to her… and that is just not something Lunella is interested in having any more of. To make matters worse, Amadeus Cho, the ‘Totally Awesome Hulk,’ shows up asking Lunella to go over some new figures he’s derived from the fabled Banner Box (the assessment measure that identified Lunella as the smartest on earth). The Thing is none too pleased to see Cho; from his experience, gamma green goonies can only mean trouble. Cho’s a pretty smart guy himself, but when he’s in his Hulk-form, his surging testosterone levels tends to get the best of his judgement. 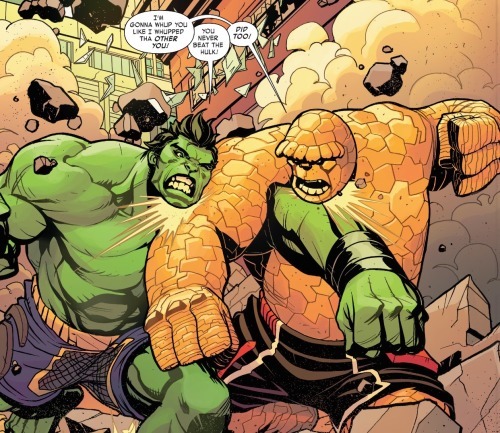 Before you know it, it’s clobbering time and a fight breaks out between The Thing and The Hulk right in the middle of the lower east side. And if Moon Girl doesn’t do something to put stop to it, all of Yancy Street could end up pulverized. Devil Dinosaur enters into the fray. He’s eager to jump into the fracas with The Thing and The Hulk, but Moon Girl grabs his tail, She insists they need to contain the fight, not add to it. 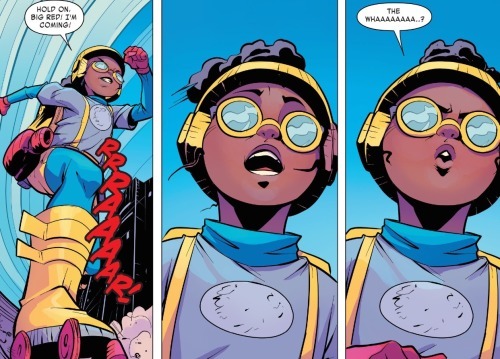 Moon Girl devises a plan and, assisted by Devil D, she uses her handmade arsenal of nonlethal weapons to keep the Hulk and Thing’s battle focused and isolated within a single evacuated intersection. 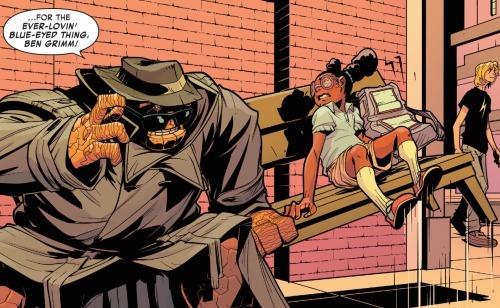 With her skates and spring loaded shoes, Moon Girl is somehow able to keep The Thing and The Hulk so close together that the quickly tire out and collapse. Later that evening, Lunella sits on the fire escape of her family’s apartment, thinking over the events of the day. She has been in need of a goal, some purpose unto which to direct her vast intellectual energies. Preventing super beings from causing destruction had felt quite satisfying and worthwhile. Perhaps that may be the new aim of her ingenuity. 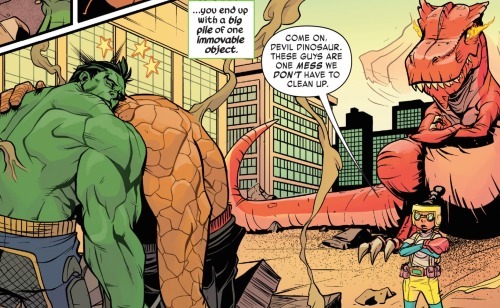 Before Lunella can give the matter more thought she senses that Devil Dinosaur is in peril. She leaps down from the fire escape, rushing in the direction of her crimson compadre. Turning a corner, Lunella discovers that Devil D is not in danger at all; rather he is just playing, wrestling with The Thing. The Thing takes a break from playing with Devil D top chat with Lunella. He says that he had no reason to worry about her. He’d been concerned that her big brains might get her into trouble, but considering she could essentially take out both himself and The Hulk has assuaged his worries. In the end, The Thing does impart a lesson onto Lunella. He reminds her that it’s important to have fun, to take time out to just be a kid. It’s the same lesson that The Thing so often imparted onto his best pal, Reed Richards. It was often the rich and intriguing irony of those great Fantastic Four tales that a being as monstrous-looking as The Thing was usually the one who taught everyone the importance of being human. Meanwhile, somewhere quite far from Yancy Street, the nefarious Dr. Doom is wandering through the bowls of some grim and forbidding castle. Speaking to himself in the this person, Doom laments that the accursed Reed Richards in no longer on earth… that he now requires a new worthy adversary so to prove his intellectual superiority. He has his computer console analyze web traffic and various databases until an answer is made available. What he learns causes Doom to do a spit-take with his wine. He reads that Lunella Lafayette has been identified as the smartest person on earth. It’s shocking and an effrontery that anyone might consider this youngster Doom’s intellectual superior. 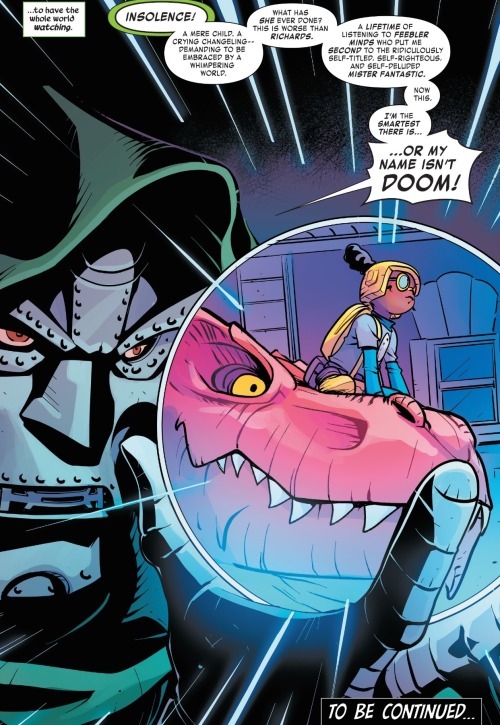 Doom initiates his plans immediately, he will tinker and toil and will not rest until this precocious pipsqueak is put in her place and Doom is once more hailed as the smartest of them all. Keep note, however that the series has made specific mention to taking place in the current 616 universe. A universe where Victor Von Doom has apparently cast aside his villainous ways and is attempting to make amends as the new Infamous Iron Man. If this is the case, then who is this other figure parading around like he is Doom? Is it a malfunctioned Doombot? A version of Doom from an alternate timeline? Or perhaps Doom’s adoptive son, Kristof? Kristof after all has been known to don his father’s armor and has often seemed eager to follow in his footsteps. Whatever the case, I’m looking forward to finding out exactly who this Doom is and what he has in store for our heroes. Ray-Anthony Height does a very fine job filling in for Natacha Bustos. It’s neat seeing someone else’s take on Lunella and Height does very good work maintaining the visual continuity of the general look of the book, especially in terms of how Devil Dinosaur is illustrated. I must admit I got a bit lost in the action scene wherein Moon Girl was using her spring shoes to keep The Thing and Hulk corralled. It didn’t quite click at first and I had to flip the page back a few times before I realized that she was keeping the two bruisers right next two each other, causing them to loose steam before too much damage had been done. A minor complaint. Tamar Bonvillain’s colors are, as always, just fantastic. As a very exciting treat, this issue also included a fan mail page. I’m all about bringing the letters page back to comics and very much hope the trend continues with MG&DD. This issues’s letters page has some neat art as well as a very smart note asking for the return of Kid Kree as soon as possible (I concur). The page even published the barely legible frothings from a certain psychologist by day Inhuman super-fan by night I know (spoilers, it’s me :3). Highly recommended; Four out of Five Lockjaws!